Available with 2" or heavy-duty 2-3/8" O.D. frames, these 46"Sq. (3 Seat ADA - 46" x 57", 2 Seat ADA - 46" x 68") octagon picnic tables have round edges to protect from unwanted bumps and bruises. The # 11 gauge punched steel is welded inside the angle iron frame with an attractive yet protective thermoplastic coating. 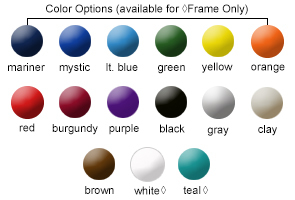 Both the 2" and heavy-duty 2-3/8" powder-coated frame tables are available with 4, 3 or 2 attached benches, and the top & seats can be finished in a variety lightly textured Polyethylene colors that will protect the table/bench from corrosion, vandalism, and other weathering effects, while also maintaining its visual appeal for years to come. 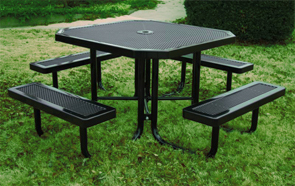 All wheelchair access octagon picnic tables conform to latest ADA specification.